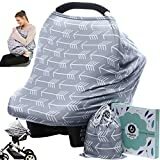 Multi-use covers for new mothers - carseat canopy, baby car seat cover, privacy nursing cover, stroller sun protection covers, shopping cart cover, feeding chair cover, carrier sunshade, and even a infinity scarf. 360° full coverage - If you need to breastfeeding your baby when you in public, how do ? Now just take 5 seconds to wear our nursing cover, everything is so simple! It made of infinity tubular shape, select high stretchy & breathable fabric, provides full privacy coverage and enough space while nursing. Full protection for your baby - Provide a cozy environment while your baby sleeping in the stroller or carseat (sunshade & blackout blind). Protects from summer heat & sunlight, onlooking strangers, airborn dust and dirt, Bug and potential germs, wind. Easy to use - No any straps or fasteners involved, steps just like wear a t-shirt, when you use as a nursing cover or a car seat canopy. Top have a 12.7 inches opening, allows you see your baby while breastfeeding or baby sleeping in the car seat. EACH ORDER ATTACHED A FREE CARRY BAG, FOR YOU STOREGE THIS COVER OR OTHER BABY PRODUCT. Practical baby shower gift - selected pattern, brand packaging, multipurpose. Absolute practical gift for baby shower party, and new moms.